The exquisite book From Nothing to Zero presents edited extracts from letters written by asylum seekers held in Australia's detention centres. These letters provide a rare glimpse into the world of refugees who have fled war and persecution in their own countries. Several of the contributing detainees have been held for more than three years, often with no end to their incarceration in sight. This compelling book gives voice to people whose thoughts and experiences are only rarely heard. By agreement with Lonely Planet Publications, we sold hundreds of copies of this exquisite work - but alas, that has come to an end. About the publication Janet Austin (ed), From Nothing to Zero (2003): This book is now out of print, and we no longer supply it to our members or to the wider public. We suggest you could search for online second-hand bookshops to secure your copy. This publication was printed and published entirely on a pro-bono basis by The Lonely Planet Publishing, features an introduction to each chapter by Julian Burnside QC, and the book presents edited extracts from letters written by asylum seekers held in Australia's detention centres. 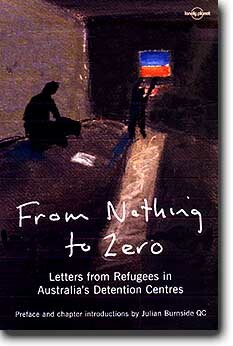 6 May 2003: Malcolm Fraser launches the book 'From Nothing to Zero' - "These extracts from letters from asylum seekers will help Australians see the refugees' many human problems. They have their hopes, their fears and their concerns for the future, as we all do. Their stories should create an understanding that people from different countries, different cultures and different religions have very similar concerns and interests to ourselves." "These extracts from letters from asylum seekers will help Australians see the refugees' many human problems. They have their hopes, their fears and their concerns for the future, as we all do. Their stories should create an understanding that people from different countries, different cultures and different religions have very similar concerns and interests to ourselves." "This book makes a moving and memorable contribution to the debate over the treatment of asylum seekers. It provides direct evidence of the cruel and inhumane consequences of mandatory detention - evidence we ignore at the peril of our national pride." "Past history tells us that when this shameful period in our history becomes past history it will quickly be covered up - and there'll be no saying 'sorry'. All the more reason to read this remarkable book." Generally 84% of asylum seekers are found to be genuine refugees, yet thousands languish in Australia's illegal immigrant detention centres. Featuring an introduction by human rights activist Julian Burnside QC, this moving anthology presents edited extracts from letters written by asylum seekers in response to a letter-writing campaign by Australian citizens. These letters give a human face and voice to one of the most controversial issues affecting the world today. All profits from the sale of this book will be donated to the Refugee and Immigration Legal Centre and the Asylum Seeker Resouce Centre, Footscray (VIC).